Is Coye the singer? Could the writer's name be Coye Boatner? 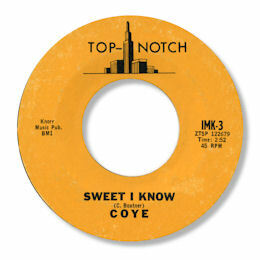 Or is the band's name Coye? I really don't know and this terminal obscurity may never reveal its secrets. But I do recognise good music when I hear it and this track is very fine bluesy deep soul indeed. The lead singer, whoever he is, screams and growls his way through the song like a man possessed. The background in Sweet I Know plods along keeping pace with his excited cries. Certainly not a masterpiece but great little label soul.